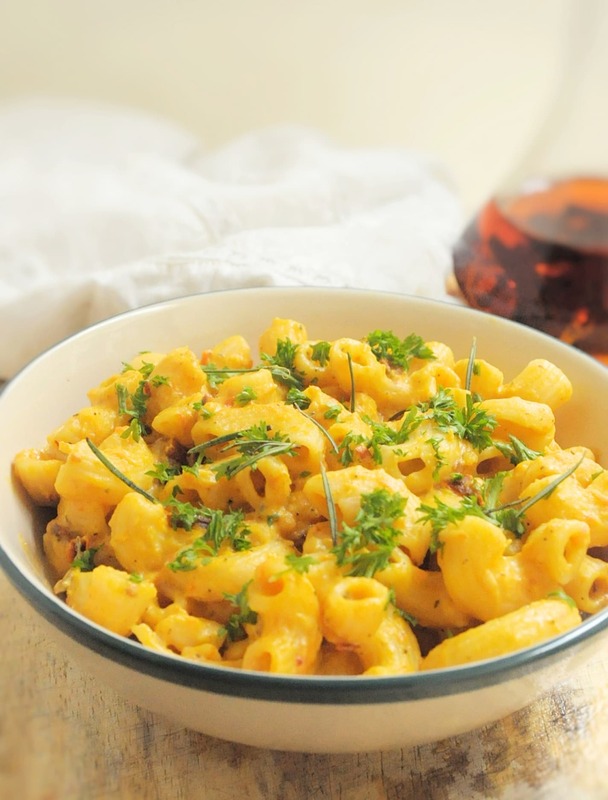 Mac and cheese is a comfort food that has transcended not only borders but also oceans! While parathas and capsicum potato curry remain my ultimate comfort food , pasta in a creamy sauce is my elixir when I am looking to curl up in a corner with a book. I love a simple pasta with just butter and some bacon..but if I have a hankering for something cheesy nothing warms my heart more than a mushy warm creamy bowl of mac and cheese. My only complaint with mac and cheese is that it is too heavy and high on calorie for its own good. So, I have come up with a skinny Mac and Cheese recipe, which lets you indulge without giving you love handles. I have replaced cheese and cream with pumpkin and milk. If you want to make lactose free version of this recipe you can skip the milk. Butternut pumpkin Butternut pumpkin is not very common in India so if you want you can replace it with a normal pumpkin that’s all right too. Cut the pumpkin into two.Drizzle with oil and salt. Roast the pumpkin and rosemary in the oven at 180 degrees for 30 minutes.Can be pan roasted for 15-20 minutes till soft. Scoop the soft pumpkin and pumpkin in a food processor.Blitz till you get a creamy mixture. In a pan heat oil.Add garlic and saute for 5-10 seconds.Add the pumpkin mixture and milk. Add Salt to taste and strips of sundried tomatos..Cook for 2 minutes. Add the pasta.Mix and garnish with cheese. My all time favorite ! Its a hit at any occasion, always gets me compliments . And so easy and creamy and cheesy and so so so good to eat .This is why they say food makes you feel good. Comfort food done ! Thankyou Divya! I had almost forgotten about this recipe.Will make it for my baby now..I am sure he will love it!